The following analysis is based on that categorization. Several cards are in more than one category, so I've categorized them based on their primary or common case. E.g. Ancient Animus is both "Removal" and "+1/+1 Counter Interaction", but you're going to cast it to kill something -- the +1/+1 counter is a nice bonus. There's no explicit or stated goals of the deck, so I can't evaluate the cards against that. If you have a goal, let me know. 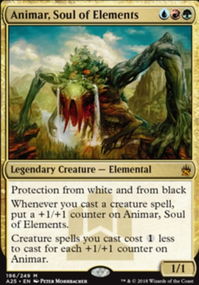 Animar is cheap to cast and protects himself from most removal (due to his protection from Black and White). Because of this, we can assume that we will get him out early and keep him out long enough for him to provide benefit. We'll build the deck assuming Animar is on the battlefield at all times. 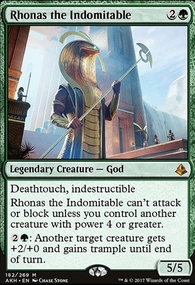 Since Animar reduces the colorless component of creature costs, we'll get the biggest benefit from colorless creatures. As with any unlimited cost reduction effect, we should look for ways to break the free case. The obvious one here is to bounce and recast colorless creatures for free. 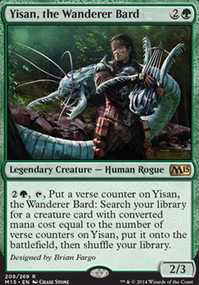 Since we're playing all of these (hopefully free) creatures, Animar will grow quickly. Giving Animar good evasion will give us to win on commander damage quickly. 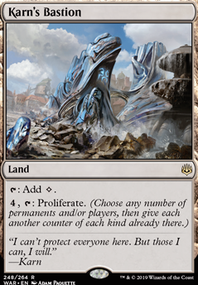 The easiest way to break Animar is to create an engine that casts colorless creatures and bounces them to your hand as many times as possible during a turn. 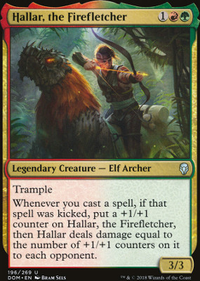 We'll want ETB/LTB effects on those creatures and cards that care about creatures entering and leaving the battlefield. 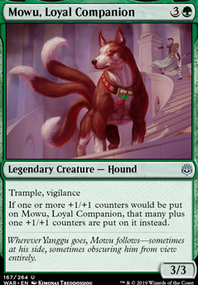 Additionally, we'll want cards that care about +1/+1 counters on a creature. Favor creatures over non-creatures, as you get a discount on creatures. Try to keep colored costs to a minimum - avoid double or more colors in a cost. We'll want to get as many creatures down as quickly as we can. Card draw and other card advantage effects are valuable. I would consider cutting way down on the amount of ramp. Mana dorks get the deck running early, but they don't have any synergy with the core effects. I suspect that's what was leaving you feeling like you had a dead hand. Wild Cantor . Requires a sac for effect. Doesn't get cost reduction. A dork that taps for mana would be better. Tinder Wall . Same as Wild Cantor sans the cost reduction bit. Vivid Creek and Vivid Crag . These both ETB tapped, don't have basic land types, and only provide off-color mana twice. 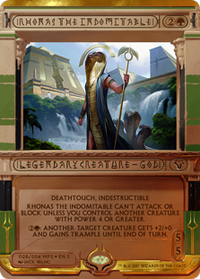 If would strongly consider running Amonkhet cycling duals over these. Ancient Ziggurat . Be careful, as this mana can only be used for casting creature spells. I don't like this land in most decks. Bond Beetle . I have no idea why this is in here. It works once and has very little synergy with the deck. Verdurous Gearhulk would be better, but still not great. Green Sun's Zenith . I think a cheaper card that tutored to hand and then let you cast the card would be better, as you'd get the cost reduction effect and other synergies. No cards come to mind, but there are lots that look at the top X cards and tutor to hand ( Gift of the Gargantuan , etc.). lol, Bioshift is one of my favorites, nice! Have you ever considered Rabid Bite over Epic Confrontation? Rabid Bite is one-sided, basically like burn. 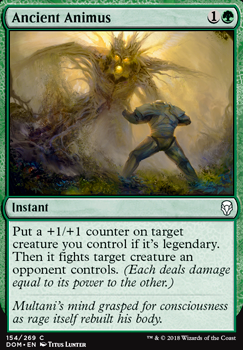 There's also the instant-speed one from Dominaria or M19... Ancient Animus. +1 Nice and shiny, just like my... window after I clean it. Have you considered Ancient Animus? 3 drops that fit: Nissa, Steward of Elements, Courser of Kruphix. Green and blue don't have much removal but blocking. Bouncing: Repeal replenishes the card you spent. Spell Pierce and Spell Snare are cheap enough to fit (still cast something and leave 1 mana open) but are situational. Green: Prey Upon, Ancient Animus, Setessan Tactics, Epic Confrontation. With only 3 legendary creatures, you should probably just play Prey Upon over Ancient Animus. If you play with the deck more and feel like you need more sources of card advantage, don't forget about Jadelight Ranger and Merfolk Branchwalker.